Donna Gillispie, a special longtime friend of mine, is a wonderfully talented artist in the scenic Ozark Mountains in the Branson, Missouri area. She has won many well-deserved awards for her watercolor paintings and is frequently invited to share her skills in art classes and seminars. She is also an expert in creating beautiful hand-marbled papers, a relatively rare and intricate artform. Because of my friendship with Donna and her husband Jack, I have been a perennial visitor to the Branson area for quite some time. We enjoy fishing, canoeing, etc. up in that area, and Branson is also well-known for its music venues. So those trips afford me the additional opportunity to perform with my musical saws in that area, including several occasions at Silver Dollar City, a regional theme park. 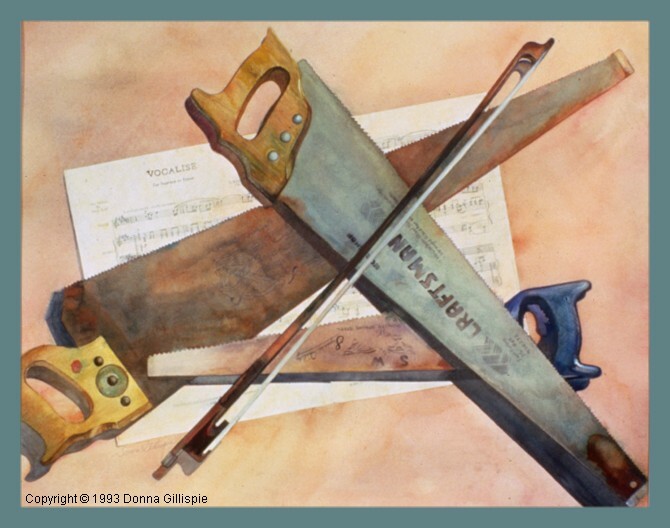 Donna had been planning to surprise me with a gift painting of my saws for some time, but this would prove to be an obviously difficult task to keep secret, since she wanted to personalize it as much as possible. In 1992, I was honored to debut with the Dallas Symphony Orchestra as a saw soloist in a series of concerts. To mark this occasion, Donna decided to paint the above watercolor. So while I was visiting in Branson later that year, she photographed three of my saws on her patio to use as a reference. She subsequently had me send her a copy of the music that I performed with the Dallas Symphony, the Rachmaninov Vocalise , which she painted quite detailedly into the background. On my next trip to Branson in 1993, I became the proud parent of the original painting and brought it back to its new home here in Texas! Thanks, Donna! for both the painting and your friendship!